S&P 500 increased 0.37% on Monday which means it is just 3.34% off its record high. The S&P 500 is up 1.74% in March and 13.01% year to date. It is on pace to have its best first quarter since 1998. Also, it is almost up 30% from the Christmas Eve low. The market has rebounded very sharply after its slight correction earlier in the month. Even with this rally, the CNN fear and greed index stayed at 65. That’s great news. Most investors looking at the year to date returns would say the market is wildly overbought. To be clear, that doesn’t mean most investors are bearish. Plenty of momentum chasers can believe stocks overbought, but still buy them. As you can see from the chart below, the NDR crowd sentiment poll is at 66.2 which is slightly above the threshold that signals extreme optimism. Since December 1st, 1995, when this index has been above 66, the S&P 500 loses 3.52% per year; it gains 3.96% per year since the start of 2015. Keep in mind that this reading is from March 7th which was the 2nd to last day of the week-long mini correction. Since stocks have more than recovered the losses from that week, I guess the index is somewhere in the low 70s right now. Nasdaq was up 0.34%, Russell 2000 was up 0.67%, and VIX was up 1.71% to 13.1. The rally in the VIX could signal the market is ready for another pullback. I am surprised with how quickly stocks have rallied in the past 6 trading days. 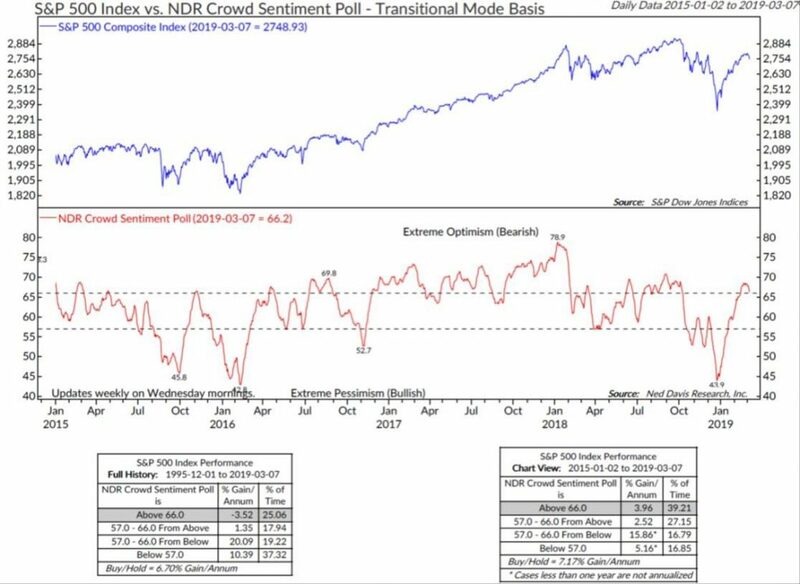 Traders are acting like that pullback earlier in March was a real correction instead of a modest pause in this face-ripping rally that started late last year. Best 2 sectors on Monday were energy and the financials as they increased 1.39% and 1.03%. It’s notable that energy’s earnings weakness was much worse in 2015 than it is now. Oil drillers have utilized technology to lower their cost of production per barrel. Financials shouldn’t like the flattening curve and lower rates. They will be helped by an improving housing market. Worst sectors were real estate and communication services as they fell 0.51% and 0.8%. Record Closing High - Boeing and Facebook were the big losers. Boeing stock fell 1.77% to the lowest point since the Ethiopian plane crash. The company received a grand jury subpoena over the weekend. Boeing is working on a software update and pilot training revision that fixes the MCAS flight control law’s behavior in response to bad sensor inputs. Facebook stock fell 3.32% which was its worst decline of 2019. The stock is now down 7.44% in the past 3 days. The stock fell on Monday because Needham downgraded it to a hold. A big issue before this decline was that people won’t want to work for Facebook now. Especially now that it is seen as a bad company for the world by the public. The talent drain will limit the firm’s ability to execute new product launches. That’s why I went negative on the stock before this decline. On Monday, the treasury market was flat as the 10 year yield is at 2.6% and the 2 year yield is at 2.45%. I think the market has locked in where rates are going to be on the day of the Wednesday Fed meeting. 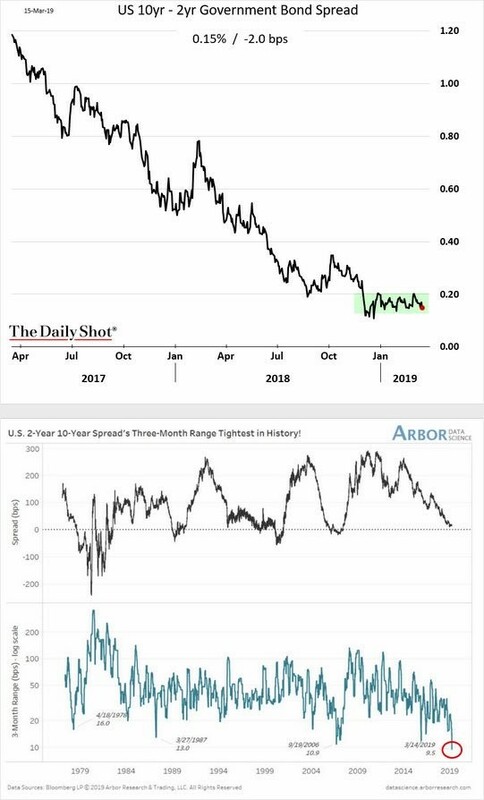 As you can see from the top chart below, the difference between the 10 year yield and the 2 year yield has been in the high teens for the past 3.5 months. As the bottom chart shows, the 3 month range in the difference between the 10 year yield and the 2 year yield is 9.5 basis points which is the lowest since at least 1979. This tight range obviously won’t last forever. I think the next move will be towards an inversion since other parts of the curve have already inverted. The 10-2 year curve could easily invert in a few days because when it breaks out of this range, the movement will be quick. Record Closing High - Rate Cuts Coming? There is still a very likely chance that the Fed will do nothing on Wednesday. 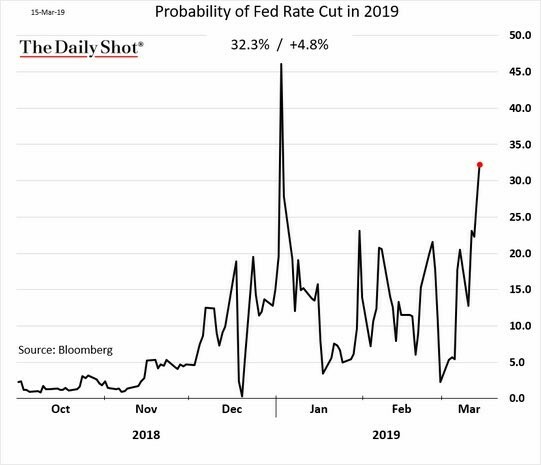 However, the odds of the Fed cutting rates at least once this year have increased as the chart below shows. It’s interesting to see rate cut odds increasing with stocks increasing. Stocks were plummeting the last time traders started expecting cuts in 2019. CME Group has the latest odds of a rate cut at 27.4%. Personally, I don’t think the Fed will cut rates because the economy isn’t weak enough to justify them. I think economic growth could rebound in the 2nd half which would make cuts unnecessary. If the Fed doesn’t imply that it will cut rates this year at its March meeting, investors could view this as hawkish and sell stocks. A cut is a far cry from the last guidance in December when the Fed projected it would hike rates twice in 2019. The stock market is very overbought again, but it looks like it will make a new record high in a few weeks. Treasury curve hasn’t moved this year. When it breaks out of this range, there will be an inversion. Luckily, an inversion doesn’t mean a recession will occur soon. A recession could start as late as 2021. The stock market could peak anytime between now and 2021. I’m more concerned with when the current slowdown will end than when the next recession will start.